We are a select, dedicated group of individuals focused upon positively impacting the Mongu region of Zambia. We work together, socialize together, but most importantly we pray together for our Mongu community and global partners. 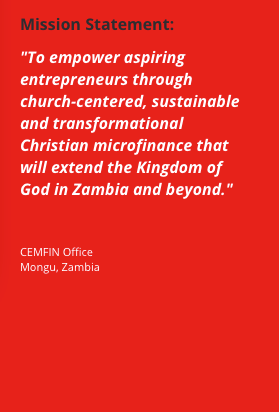 Here at CEMFIN our vision is to realize the fullest potential of our partners spiritually, economically and socially through the active participation of the local church. We hope to instill this vision in our clients through training courses, cooperation with local Christian organizations and our own behavior as models of Christian action. There are always wonderful stories of God's love found within our community and the work that we do. Please join us for updated news and the latest adventures in Mongu! CEMFIN began with prayer. We continue to seek God's favor and are amazed at the path He has led us on thus far. Our history was nothing if not a faith journey!